It's the percentage of American men with full beards reported annually. Nothing serious here, but absurdly perfect for a set of posts to share a couple things that took me a while to learn when plotting in R.
How much American beardfulness there was in the late 19th century and early 20th. 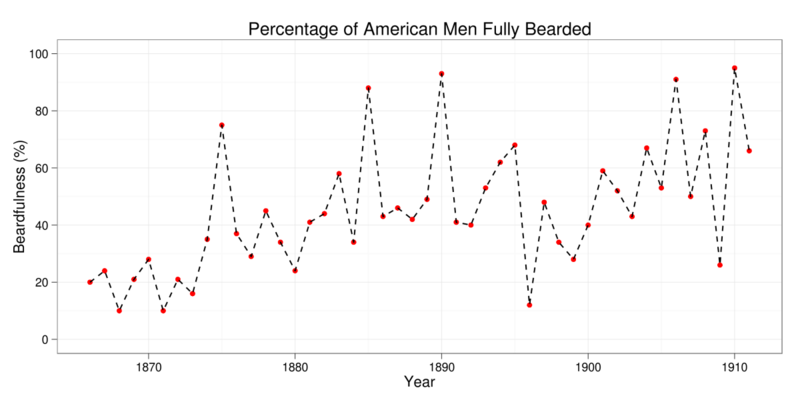 "Percent of Men with full beards, 1866 – 1911. Source: Hipel and Mcleod (1994)." Robinson, D.E. Fashions in shaving and trimming of the beard: the men of the Illustrated London News, 1842-1972. American Journal of Sociology, 81:5 (1976), 1133-1141. I'm told the AJS is actually a definitive journal, so whatever point is made here, this was likely kind of a big deal in 1976 sociology. I haven't been able to get digital access to AJS this far back, so if you have any additional information or the missing data forward to 1953, please let me know. This is one of those mundane-enough-to-be-crazy numbers no one should actually have, like how management consulting interviews ask you to estimate the number of rolls of toilet paper in the Empire State Building---similarly, I'd wager D.E. Robinson has an interesting methodology behind the scenes. # Put it into xts, which is a more handsome time series format than zoo. head(beardxts) # take a peek for yourself. I don't know about you, but I'm curious about the peak in 1890---traditionally "The Closing of the American West"---and in 1910. As a point of reference, President William Taft (1908-1912) had a large Hungarian-style mustache, but not a complete beard. Did I mess anything up? Leave improvements in the comments! Check out Part II to learn about how to plot recession shading.